Halloween is back again, and so is Halloween. It might sound confusing, but the simplicity of John Carpenter and Debra Hill's 1978 slasher classic is the source of its power. It perfectly encapsulates the chills of the holiday that shares its name, becoming synonymous with the boogeyman we all imagine creeping in the shadows every October. In fact, it's hard to imagine a better title, which might be why there have been two more movies in its wake that are also called simply Halloween — first, Rob Zombie's 2007 reimagining, and the new sequel from David Gordon Green and Danny McBride. Simplicity continues to be the defining characteristic of Halloween, as Green and McBride retcon away the complex continuity and gnarled family tree drama that had developed over the franchise's four-decade history. The focus is back on Laurie Strode (with Jamie Lee Curtis reprising the role that made her famous), who has been preparing for the return of Michael Myers, dormant since his All Hallows' Eve killing spree of '78. Though the story recaptures the stripped-down aesthetics of Carpenter's original vision, there's still a handful of treats scattered among its tricks, waiting to be found by sharp-eyed fans. Come along with us as we give you a brief rundown of the secrets hiding in Halloween's shadows. Just watch out for the boogeyman. Understandably, the focus of much of Halloween's hype has been on Jamie Lee Curtis and the return of Laurie Strode. Curtis' 1978 performance remains iconic in the annals of horror history, earning her the lingering title of "Scream Queen." She played Laurie again across three other decades, starring in 1981's Halloween II, 1998's Halloween H20, and 2002's Halloween: Resurrection. She even lent her voice to Halloween III: Season of the Witch, the unrelated stand-alone entry in which she can be heard as an announcer. However, while those previous sequels tended to leave Laurie sidelined in a hospital bed or killed off after a glorified cameo, the 2018 film is fully dedicated to her story, exploring the trauma that has affected her life and her family. Less obvious are some other returning performers joining Curtis for her reunion with original director John Carpenter (who takes on both producing and composing roles this time around). Michael Myers (a.k.a. "The Shape") was played by two different actors in Carpenter's film — Nick Castle was the man behind the mask, while Tony Moran portrayed the killer for the single scene in which his face can be glimpsed. Castle is back this time around, sharing the role of Michael with newcomer James Jude Courtney. An even more low-key cameo can be heard but not seen, as P.J. Soles, who played Lynda in the original movie, provides the voice of an off-screen schoolteacher. The new Halloween takes us back to the fictional town of Haddonfield, Illinois, the small community once rocked by Michael Myers' original murders. 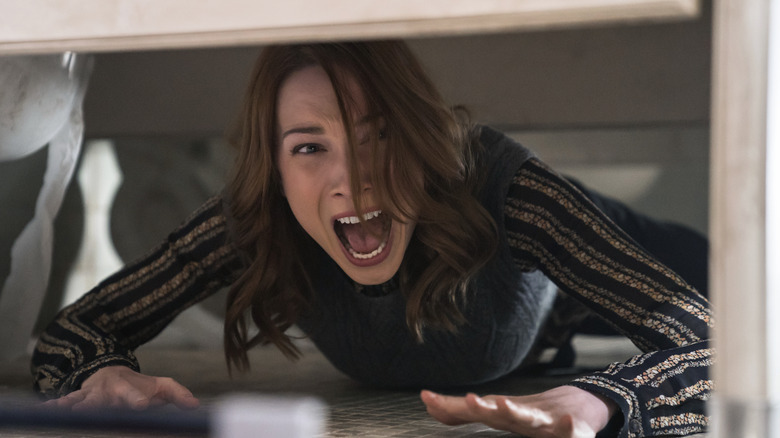 While the story keeps a tight focus on Laurie, her daughter Karen (Judy Greer), and her granddaughter Allyson (Andi Matichak), Green and McBride nonetheless made sure to include a few nods to the continuing history of the town around them. Nick Castle has praised the filmmakers' dedication to recapturing the "neighborhood-centric" feeling of Carpenter's classic, which they achieved in both writing and design. The original Halloween was shot during the summer in California. Grappling with a very modest budget, Carpenter's crew had to simulate a Midwestern autumn by spreading dead leaves on the ground, despite the trees visibly blooming in several shots. 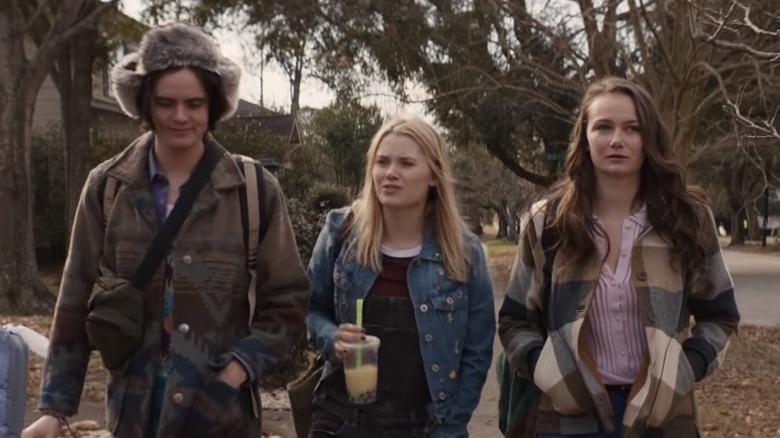 The new movie, shot in South Carolina in the winter, recreates this unsettling juxtaposition during an early scene in which Allyson and her friends stroll down Haddonfield's leaf-strewn sidewalks under green foliage. Beyond the visuals, citizens are name-checked too, with Allyson's boyfriend Cameron Elam (Dylan Arnold) established as the son of Lonnie Elam, a trouble-making classmate of young Tommy Doyle in 1978. 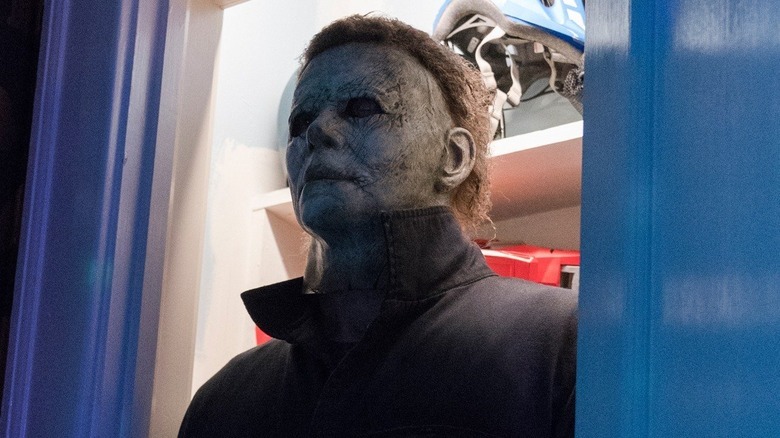 In addition to set dressing and name-drops, Green and McBride have peppered their Halloween with a number of cinematic allusions to its predecessor. From in-jokes and references to inversions and reversals, it will be impossible for longtime Halloween fans to watch this new take without feeling a certain sense of déjà vu. This is obvious right from the opening titles, which revive the jack-o-lantern that kicked off the first movie, inflating its rotten form while credits roll in the familiar orange font. 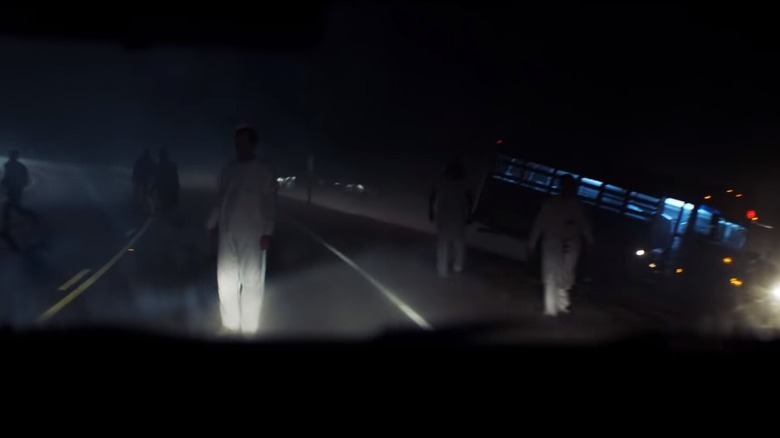 Michael's 2018 hospital escape mirrors his first, with white-gowned mental patients wandering eerily by the glow of car headlights. Later, a familiar playground rhyme echoes during the trick-or-treat sequence. The real fun begins, though, when Laurie herself takes the place of Michael in a number of familiar moments, particularly the climactic balcony fall and subsequent disappearance. Her face also looms in the darkness behind him at one point, just as he had loomed behind her. Allyson even sits through a lecture about fate while her grandmother watches her from outside her classroom, a scene lifted almost directly from the original. In the end, the fire that at last consumes the Shape also burns a dollhouse which bears a strong resemblance to the original Myers home. 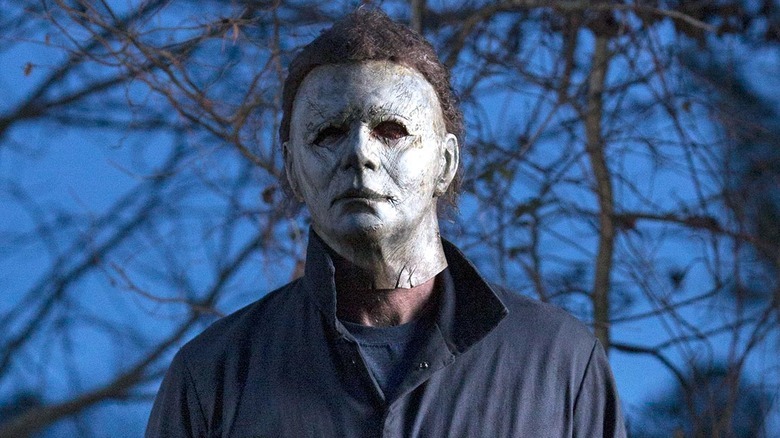 While the new movie ignores all the sequels that preceded it, McBride and Green still set out with an intention to "pay homage to every Halloween movie." Their film states that Michael has been in custody ever since that fateful night in 1978, making it clear that none of his later shenanigans ever happened in its world. However, winks and nods abound to console fans who might be miffed about this new timeline. 1981's Halloween II revealed that Laurie and Michael were siblings, suggesting that his killing spree was somehow motivated by his own bloodline. Further sequels took this concept further, sending the Shape after more relatives and proposing an ancient curse as his motivation. The new movie has Allyson quickly dispel the notion of Laurie and Michael as sister and brother, though the rumor of their relation persists in Haddonfield. More subtle sequel references include a glimpse at Halloween III's sinister masks, a gas station bearing a strong resemblance to a set from The Return of Michael Myers, and a public restroom setting similar to a scene in H20. There's even a line of dialogue about how Haddonfield can't just "ban Halloween," which was exactly the basis of John Carpenter's unproduced pitch for the fourth film in the series. Donald Pleasence was one of the few mainstays of the Halloween sequels, playing Dr. Sam Loomis in five films before his death. 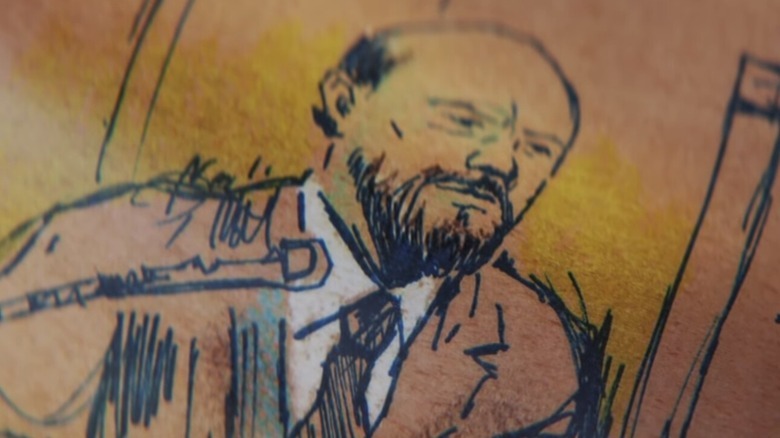 Acting as something of a Van Helsing to Michael's Dracula, Loomis dedicated his entire life to stopping his famous patient, even when no one believed him about the danger they were in. In the first movie, he sums up the Shape's unknowable motivations as succinctly as possible, stating that "living behind that boy's eyes was purely and simply evil." The new movie pays rather subtle but brilliant homage to this idea. Though the 2018 Halloween takes place in a timeline where Michael never escaped again during the late Loomis' lifetime, his dedication still plays a major role, and the character even makes a cassette tape cameo via a Pleasence soundalike. We are introduced to a man dubbed "the new Loomis" by Laurie, Dr. Ranbir Sartain (Haluk Bilginer), whose unhealthy obsession with understanding Michael's motivations leads him to betray the heroes during the film's climax. This backfires on him, however, as the Shape stomps Sartain's head under his boot rather than offer any answers. In the end, the bad doctor learns that what Laurie and Loomis have always said is true: there's no reasoning with pure evil.